When Jesse Stewart first found his way to Grand Canyon University a couple of years ago, he had planned to take premed courses. But he was no stranger to college. He already held an undergraduate degree in international relations, with an emphasis on the Middle East, in addition to an M.B.A. and a second master’s from the U.S. Army Command and General Staff College. Still, Stewart felt called to become a doctor to honor the memory of a soldier he credits with saving his life in Iraq. That friend, senior combat medic Ben Sebban, died in an insurgent’s suicide bomb attack at a site north of Baghdad. The blast ripped through Stewart’s team of U.S. Army Rangers and wounded 17. Over the course of his time in Iraq, Stewart said, combat claimed the lives of 14 Rangers in his troop in addition to others in a coalition task force. Stewart, 34, a retired Army major and adjunct professor who teaches servant leadership in the Colangelo College of Business (CCOB), said he tends to reflect on those memories on Veterans Day, in addition to many others from his 10-year career in the Army. He remembers the moment when Sebban caught his attention, resulting in Stewart turning away at the last second. Stewart suffered non-fatal shrapnel wounds and rejoined the fight hours later. It was the fourth time he was wounded in combat. 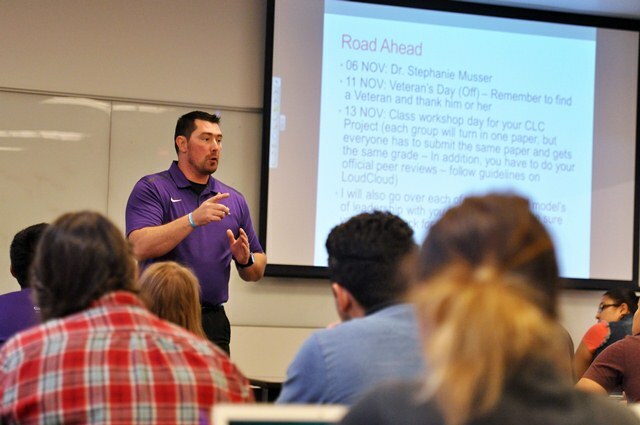 While life’s demands forced him to give up the dream to follow in Sebban’s footsteps as a medical professional, Stewart said he discovered a new focus at GCU as an instructor and mentor in the CCOB — furthering a new mission to help students prepare for their careers. He often refers to military ideals such as honor, duty and brotherhood to reinforce class lessons. “What I’ve tried to do as a teacher is instill those values in my students,” said Stewart, who is in his first semester as an instructor. The married father of two brings an impressive resumé to GCU. He earned a Purple Heart and four Bronze Stars in combat, including one for valor. He medically retired at 32 because of multiple knee surgeries and other injuries, Stewart said, but had an offer to stay in the Army to earn his Ph.D. and eventually teach at West Point. In the service, he also wrote multiple papers and thesis projects, including a paper for which he interviewed enemy insurgents, counterinsurgents and coalition soldiers. The paper was published by the Department of Homeland Security. More than parachuting out of airplanes or charging across battlefields, Stewart relished applying his intellect to serve the men and women around him. From Iraq to a brief stint patrolling New Orleans during Hurricane Katrina, Stewart aimed to be a leader. Just a couple of months into his first semester as a college professor, Stewart is already being groomed to teach online and cohort versions of the servant leadership course that’s so integral to GCU’s business curriculum. Dr. Moronke Oke, who oversees servant leadership faculty in the CCOB, said students easily connect with Stewart’s sincerity, humility and integrity. His firsthand accounts from the battlefield are unique to the classroom. When GCU faculty brought Stewart to campus over the summer for a test run in the classroom, the response was overwhelmingly positive. By day, Stewart is director of business development for a local coaxial cable technology company. So his experiences in the business world enable him to apply servant leadership principles in his daily routine. Like many veterans returning from the stresses of war, re-entry into the American workplace was not easy, Stewart said. He felt jaded at times. He grew frustrated explaining his background and experiences, especially with the sorrow of fallen friends attached to many of those stories. Since returning home, much of Stewart’s life has been dedicated to others. He helped establish the nonprofit American 300 Foundation, which supports the families of children of fallen service men and women through a scholarship fund and provides outdoors adventures for wounded warriors. When he’s not with his own family, working and teaching, Stewart is giving back — often on hunting trips or fly-fishing trips to remote places where he can help other vets heal. The foundation also connects service men and women with international and Olympic athletes to encourage resilience and strength in their recovery from combat. Stewart said his faith in God helped him through some dark times, including coping with the death of Sebban and other friends. At first, he refused to give up the multiyear push to medical school but decided it was best once a few mentors pointed him to passages in Ephesians 5. That chapter references a man’s place in his family and the responsibility a man has to provide for his family. Stewart said he felt devastated about giving up his premed pursuits once he realized he was more consumed by his own desire to honor his friend, and his own aspirations, than he was by the need to tend to the immediate needs of his wife and daughters. In Iraq, Stewart recalls seeing Islamic State’s trademark black flags and blood-stained execution swords in some areas, years before the terrorist organization would take root in Syria and become a household name in the U.S. Yet he could separate those Iraqis from those he wanted to save. 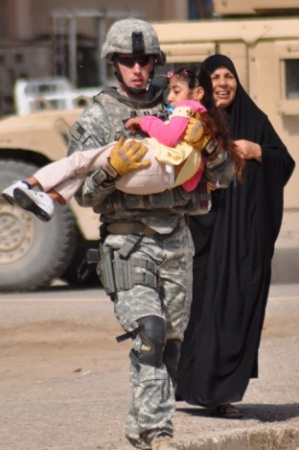 In a joint effort with Iraqi police, about two years before he retired, Stewart and other paratroopers led an operation to deliver pediatric wheelchairs to disabled Iraqi children. Stewart has seen the impact that people can make in the world, battlefield, boardroom or classroom. And he reminds his students of that as much as he can. Thanks for a great article about an amazing person! I just finished online training with Jesse and look forward to meeting him in person. It was a treat getting to know a little about him in our online training course, and appreciate the fuller story here.